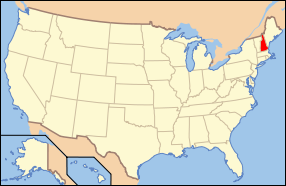 The islands are directly south of Louisiana, USA, and in the Central Time Zone. Right on the Equator. As a side note, the currency since 2000 of Ecuador is the US Dollar, rate 1:1. We visited the islands colored orange. Other boat tours visit the western islands too. The tour operator sometimes offers a deal on sticking around after one tour and signing up for the other one. The islands are all of volcanic origin. The hotspot that feeds them remains stationary, deep in the earth, while the surface plate is slowly moving toward the east. So the far western islands are still volcanically active, while those to the east have cooled down, established their own ecology, and those even farther east have begun to erode and disappear. Seven ocean currents converge in this area, one from Antarctica and others from warmer climes. Each occasionally brought with it a few members of a local species, somehow entangled in bits of branches or other floating vegetation. With luck they found mates and settled on whatever island they ended up at. They then began a long, long period of trying to exist there. Some of them made it and evolved to optimize a life in that ecosystem; others probably couldn't handle it and disappeared. Examples of Galapagos evolution include the shortest penguins in the world, at about 1.5 feet tall. They don’t need to be any taller because they do most of their hunting underwater and don’t do much walking upright. Another animal that evolved is a bird, the cormorant. It too moved to an existence where most of its food came from under water, so it no longer needed wings suitable for flying, and over time they shrunk to near uselessness. Two different examples of how evolution didn't just work to enhance positive features, but it also favored reduction of no longer needed ones that simply absorbed excess energy that could better be put to use elsewhere. The first evening on the ship, this sunset caused us all to ooh and aah, snap photos, and if you are me, sketch. I’m sure they planned it that way. 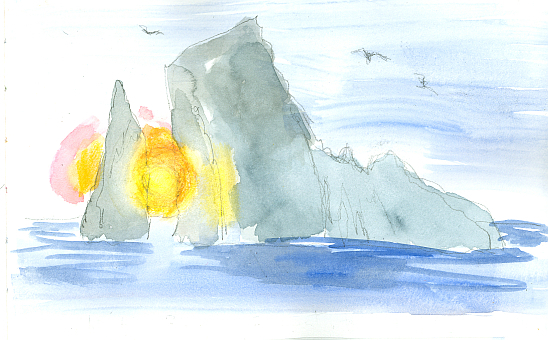 The sunlight burst through the two gaps in the dramatic rock formation known in English as Kicker Rock. We were informed that the sun sets every night at 6:30, year round. And the colors continued. The land on the horizon is San Cristobal Island. Gardner Bay on Espanola Island. Yes, I sat in the sand and painted the sea lions as they napped, rolled over, swatted flies, and nursed from their mommies. We learned that they expend so much energy catching their breakfast that they snooze for most of the rest of the day. We have even seen them asleep on park benches in well populated areas. Everybody keeps their distance. Our floating home is off to the left. Snorkelers and a Zodiak are in the turquoise water, just right of the center. We took a hike on Espanola Island just before sunset. 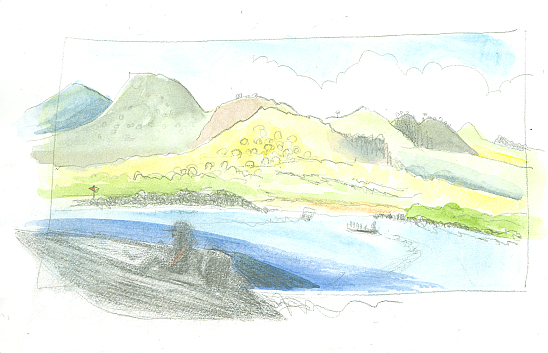 I sketched quickly when we stopped briefly. Gianna, our naturalist, explained everything in sight, as it was all new to us. 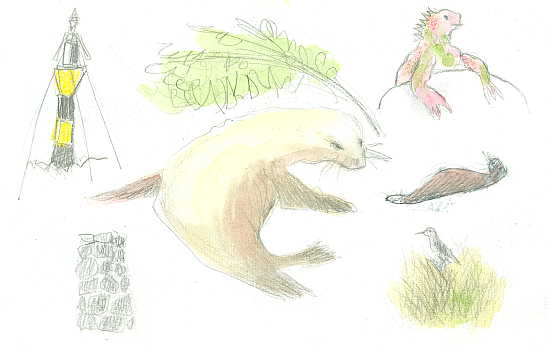 A lighthouse, a cairn, a sea lion seeking shade, an iguana sunbathing to warm up, and a mocking bird in a prickly bush. And more on the hike. A pelican silhouetted in the fading light. 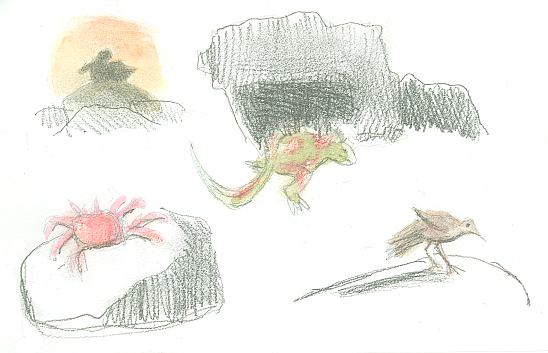 An iguana seeking shade to cool off, a colorful crab, and another bird—maybe a finch. It was stunning to us, considering our background of having lived in Maryland, to see live red crabs. Live crabs in Maryland are blue, and they only turn red when steamed. These red crabs were amazingly mobile, able to jump quite a distance from rock to rock. And our first sighting of Nazca boobies—the boobies with the grey-green feet, not the more famous blue-footed ones. And their new babies, who look just like balls of cotton fluff. The law in The Galapagos is that you must maintain a six foot separation from any wild animals. It was a challenge when we came across a sea lion asleep in the middle of a narrow trail. Every morning I pushed aside the cabin’s curtains to see what was out there. On this day, Floreana Island. It was not particularly comfortable painting while kneeling on the bed, but I persisted. Another view of Floreana Island. The views change by the minute. As the clouds shift. As the anchored ship swings around in the water. The black rubber rafts, called Zodiacs, ferried people to and from the white beach. Some landings were ‘dry’, at a dock, while others were ‘wet’. Wear appropriate footwear and wade ashore! The top image is Endebi Island, which looked like an Egyptian Pyramid rising from the sea. The lower image is Champion Island. We had options of snorkeling, a glass-bottomed boat tour, and Zodiac tours around the second island. My first sighting of blue footed boobies was here. Another inspiring end of day view from the top deck. Post Office Bay is on the far right. Next up, Santa Cruz Island. 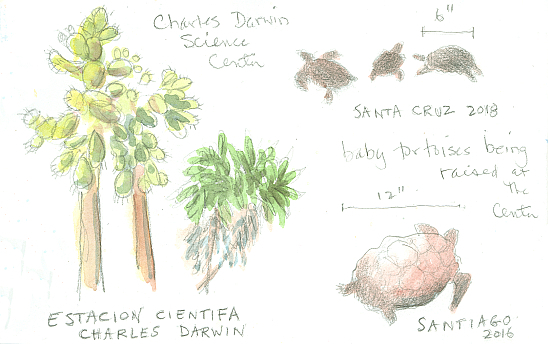 In the town of Puerta Ayora is the Charles Darwin Science Center for the study of the giant tortoises. And the successful attempts at re-population of some species. So a lot of baby tortoises were crawling about in their separate enclosures. Even as I write this there have been reports of new discoveries of evolutional significance. In one enclosure, these two types of tortoises were right next to each other. It was perfect viewing to compare the shell shapes. The guy on the left has a low, round shell, good for marching through heavy foliage and finding vegetation close to the ground. 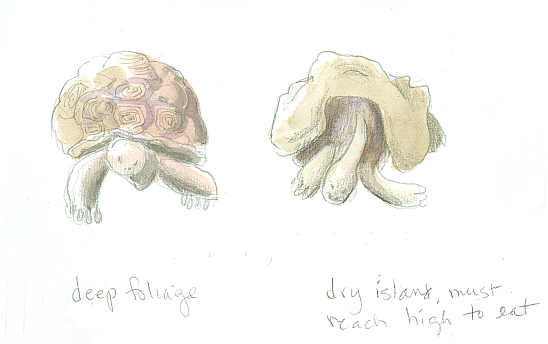 The fellow on the right evolved his (or her) shell shape on a different island where the vegetation is higher off the ground. So a longer neck is required, and an arched shell is also needed to give the neck ample room to move. You would not see these two in a natural state on the same island. After the visit to the science center we got a ride into the town of Puerto Ayora. My feet stopped moving when I got to this cemetery right next to the narrow street. 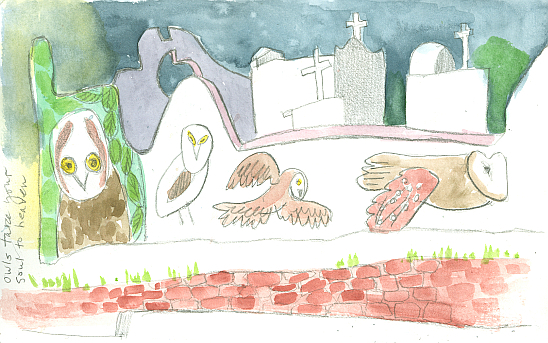 Owls were painted on the high stucco wall. There’s a belief locally that owls help send our souls to heaven. A guide told us that a competition decides who gets the privilege of painting a new design. 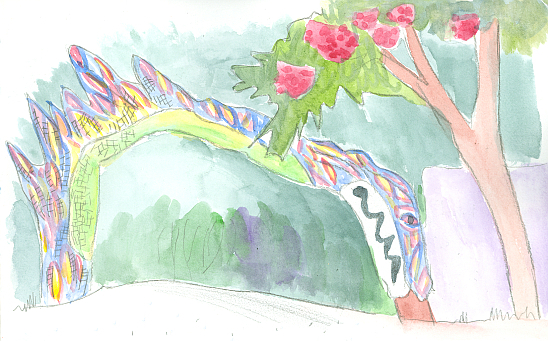 And soon after that, I couldn’t get past this mosaic gate of a dragon, without opening my sketchbook. A lovely acacia tree blooms on the right. Next up, the town fish market. All of the fish seemed to be pink, which was colorful next to the blue water of the harbor. Two pelicans are waiting for scraps. 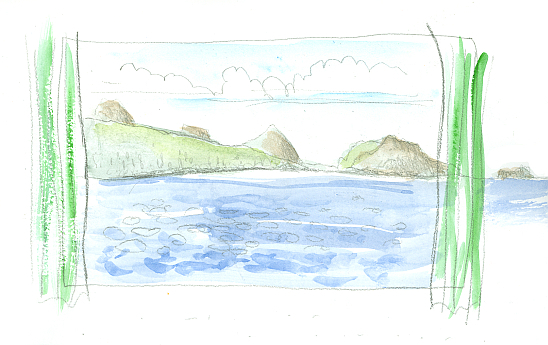 Sea lions pushed and shoved here too for fish heads but they didn’t make it into my drawing for some reason. 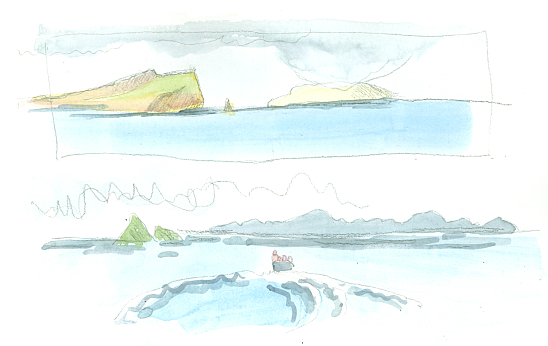 Then two, or was it three, buses took us to the Highlands, the hilly, tree-shaded top of Santa Cruz Island. 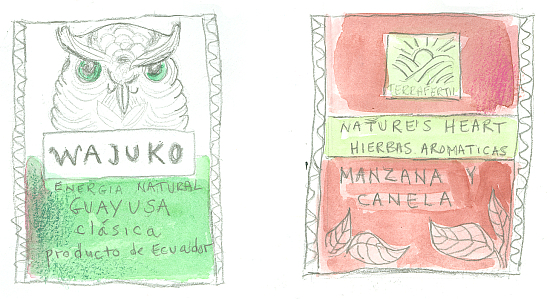 We visited a family farm where we saw sugar cane squashed into juice, and the juice boiled. Soft cheese cubes dipped into liquid brown sugar syrup were a delicious treat. Then came the fiery sugar cane liquor. Before all that we saw the family coffee beans pounded to remove a husk, then roasted over a fire. After cheese, sugar, and alcohol at the farm, it was time for lunch. We had a lovely al fresco meal at the Aquelarre Restaurant. The building, in the cool of the Highlands, was full of art and old bottles in the windows. The Chilean owners were most friendly. A hibiscus bloom and some ginger blossoms from the gardens at Aquelarre. I like signs. This one says it all, in two languages. It is where we changed into rubber boots in preparation for the muddiness ahead. After donning our rubber boots, we took a walk through a lava tunnel. Not as scary as it sounds. Then we got to wander through a meadow, staying on the path, hoping to see the giant tortoises. Yup, there they were, lumbering about and munching on grass. I drew this one just as it began to rain. 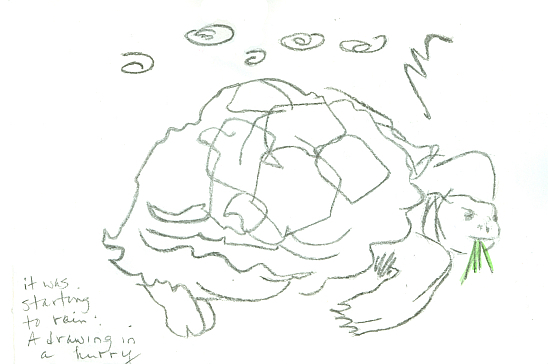 My husband held a plastic bag over my sketchbook so I could draw the large animal as fast as I could. We stayed on an extra hour in the town of Puerta Ayora before returning to the ship. I took the time to sketch the end wall of the local kids’ skate park. I love all the large sea creatures painted by the young people who use the park. The black lizards were nearby on the sidewalk. I thought they would slither away, but they posed nicely for me. 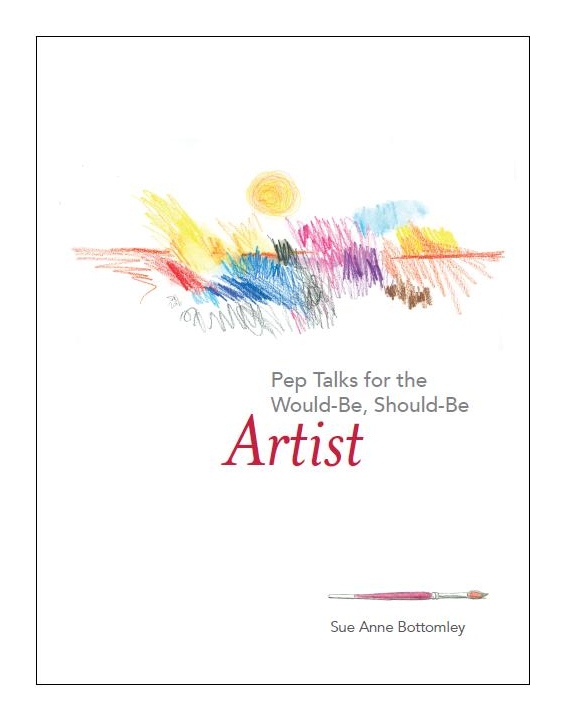 I often copy children’s art. Another view of a pretty place, Dragon Hill on the other side of Santa Cruz Island from the town. The trees along the top give it scale. The top is Guy Fawkes Island. The bottom is just labeled ‘Zodiac wake’ in my sketchbook. In the lounge area of the ship were a coffee machine, hot water, and a selection of tea bags. 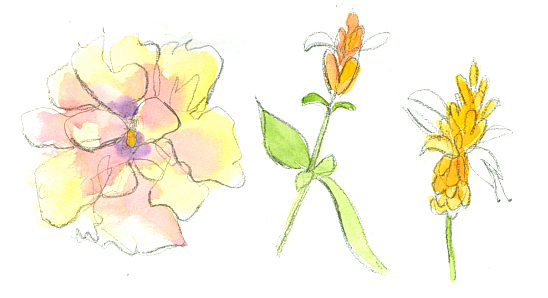 It is entertaining to draw small things. They are part of the experience. Also in the lounge were a bar and late afternoon yummy snacks. I finished my paintings in the lounge. And we saw several science related films in the area too. It was just a great hang out spot for the week. One Zodiac, and four quickly drawn kayaks. The kayaks had just been put into the water in preparation for an afternoon activity. 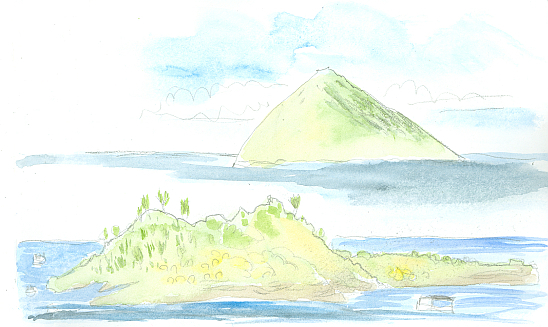 Another island, another shape to capture in the sketchbook. 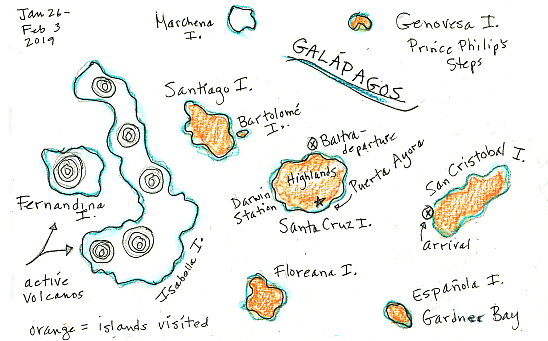 Most islands in the Galapagos are uninhabited, by people. They abound in birds and reptiles. On our last day we hiked on Genovesa Island. 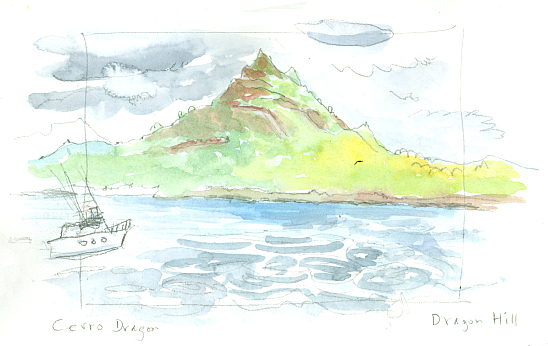 The ship anchored in a caldera (sunken volcano peak), and we climbed up a steep set of roughly cut rocks called Prince Philip’s Steps. The top of the island is flat and home to a million birds we were told. It certainly was a believable number. We kept to a narrow path, and we saw nesting bird families within three feet. 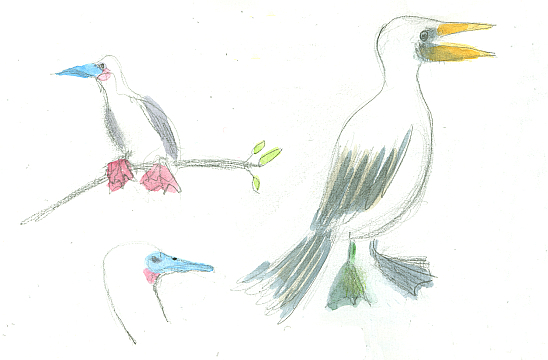 In my drawing, a red footed booby and a Nazca booby. The red footed ones, with the blue and pink heads, have evolved to have a thumb, sort of, and can roost on a low branch. 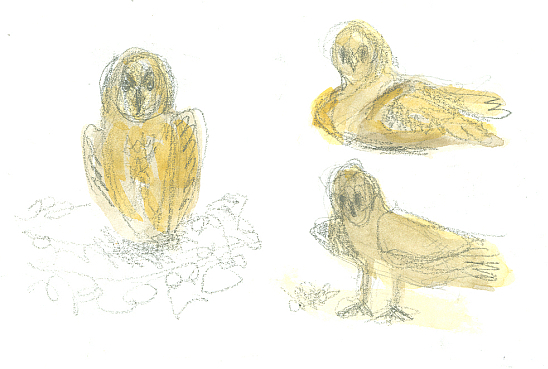 Celso, our naturalist for the hike, said we had to look very closely to see a short eared owl as they are exactly the color of the lava rocks. He was right. But we did spot two of them. 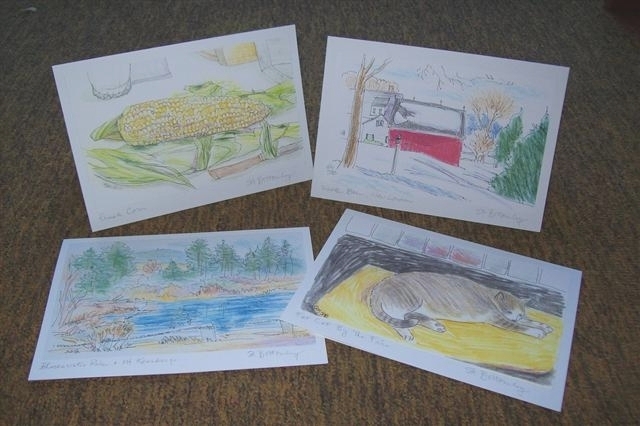 This is three drawings of the same one. 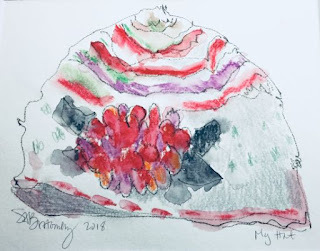 My accordion sketchbook painted on the beach on Bartolomé Island. 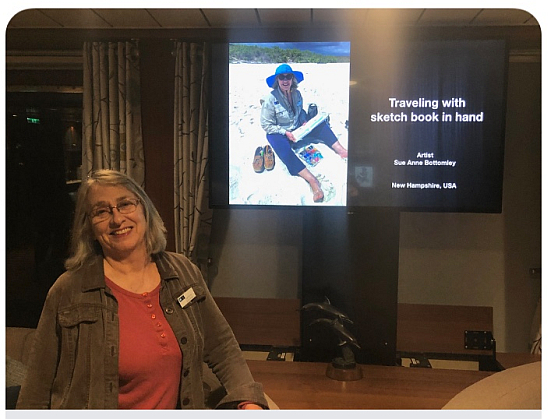 Just for fun, and because a few people requested it, I gave an art talk on the last evening on the ship. I showed the drawings and paintings I had done that weekend in my sketchbook. Before I spoke, the ship doctor played his guitar and sang. After my talk, a visiting photographer did splendid magic tricks. Once back on the mainland, we took a tour of the city of Guayaquil. Highlights were a flower market seen from the bus, a city park full of tree climbing, striped iguanas, a view of a park along the waterfront, and a walking tour of an old part of the city that merges into a very new part. 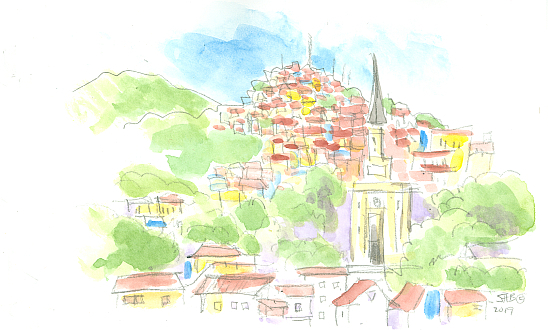 I drew this view of an old hillside neighborhood of the city, called Cerro del Carmen, from our hotel window. 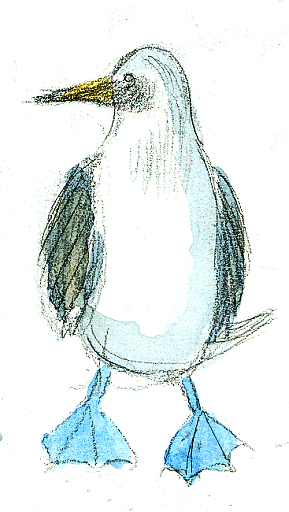 And here is what is probably the most well known animal in the Galapagos, the blue-footed Booby. Hats. 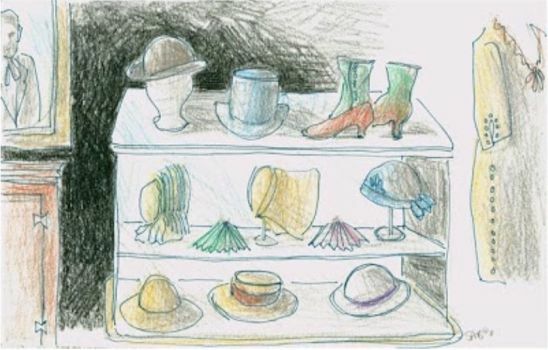 I have drawn many hats over the years, and here is a wide selection of them. Most of them are for warmth, but not all. 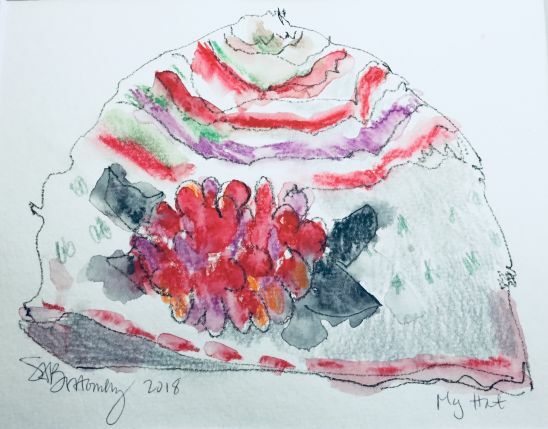 The above hat was a demonstration drawing/watercolor I did for a retirement community art class at the beginning of the month. It is currently my favorite winter hat, with the cheery felt flower pinned to the side. The art materials are charcoal pencil (which I had always thought I disliked but I have changed my mind) and water soluble colored pencil. Which are called crayon pencils in Canada. 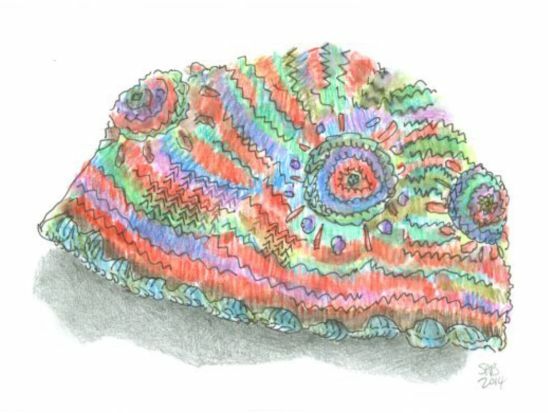 People literally ooh and aah when I release the pigment in the colored pencil with a swipe of my water-laden brush. It is a form of magic I admit. 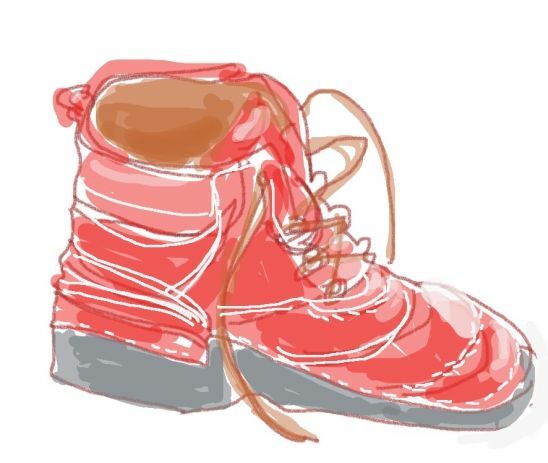 When I sketch hats or shoes, it seems like a portrait. So this is my self-portrait. A few years back,this heavy wool hat was a favorite of mine. I do not knit, but am keenly impressed by people who do. 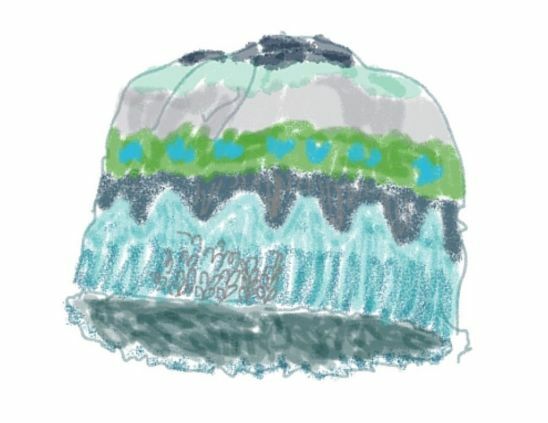 This hat was drawn digitally on my art app called Drawing Pad. It was easy to make it look fuzzy. Another well loved hat, made in Nepal. One year this hat dropped out of my pocket in the library, and I didn’t see it again for months. I shrieked in delight when I saw it on the lost and found hook. 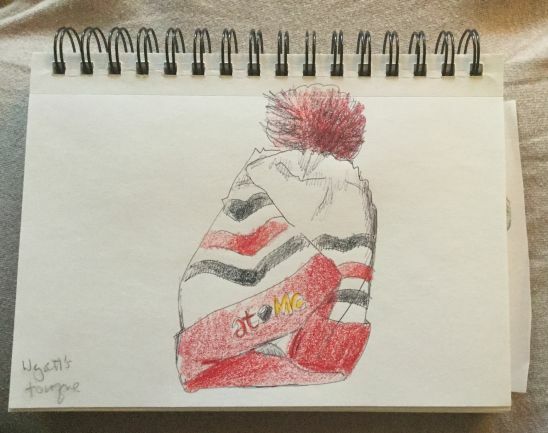 This fall I drew our grandson Wyatt’s hat. He was wearing it almost constantly when not in school. It says atomic on it and has a hockey puck in the design instead of an o. It is my portrait of him as a ten year old. 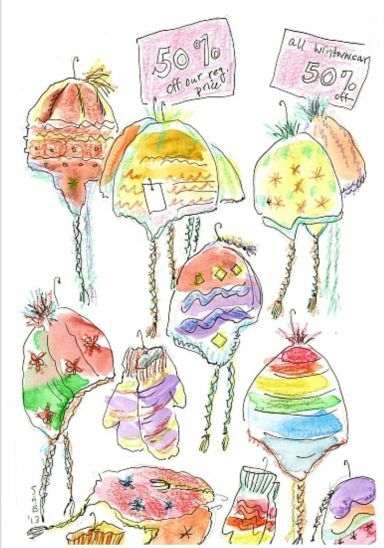 Five years ago I drew these hats on sale at our local shop. I jokingly called it the first sign of spring in our northern clime. 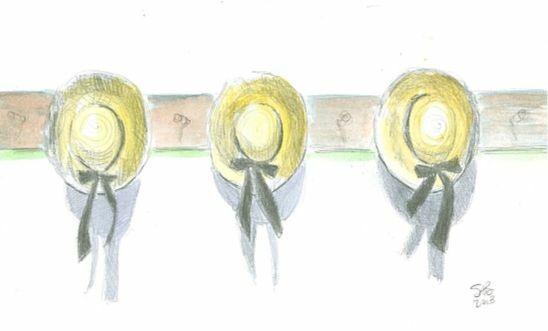 Three straw hats were hanging on wooden pegs on a wall at our local Historical Society, which is our way of saying town museum. I reveled in the subtle differences in the shapes of the brims, the shapes of the ribbons, and lastly the shapes of the shadows. Two woven items hang on our wall near the kitchen. 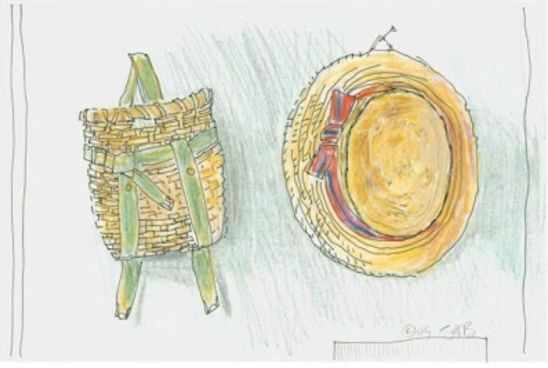 On the left is a child’s Adirondack packbasket. In pencil is written Bruce ’46. Which means that this was my husband’s packbasket when he was three years old. His parents and he spent several summers at a camp in upstate New York. His father was a very dedicated and admired counselor. He gained the camp’s ultimate recognition of having a rowboat named after him. On the right is a straw boater, worn by our two daughters, taking turns daily. It was the headwear for the summer uniform of the British school that they attended when very young. 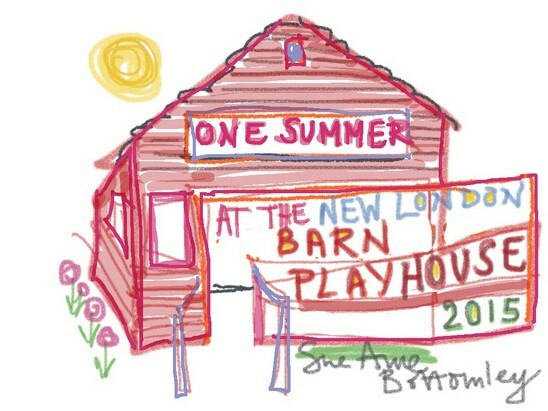 Ages four and seven approximately. 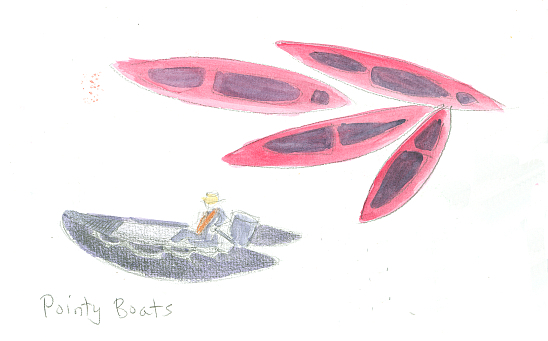 And look, another boater. This one is an adult male version. 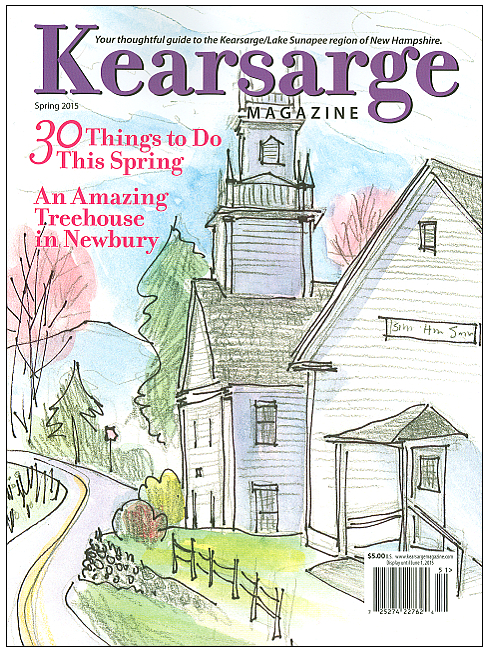 I drew this assortment of hats, fans,and one pair of shoes at another historical society in Weare, New Hampshire. 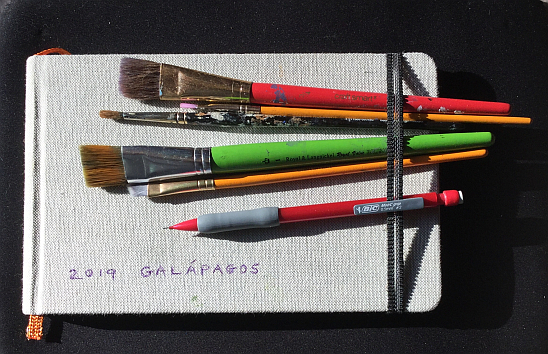 We people who keep sketchbooks can happily skip right over the “No Photography” rule in some museums. 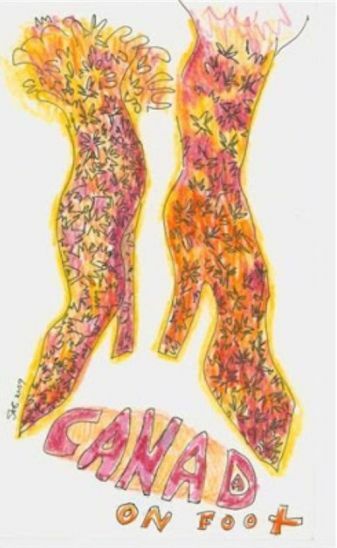 This is my transition piece, ’cause the rest of this post is about shoes. 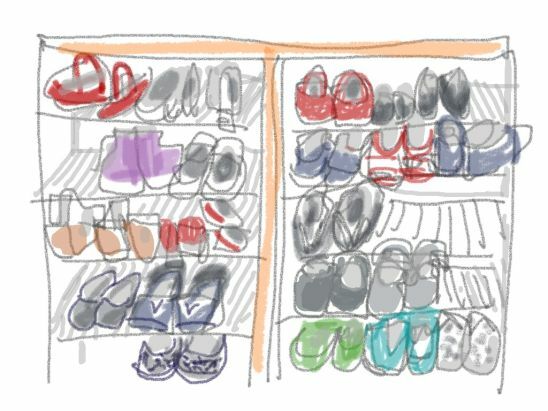 And a shoe rack at our daughter’s house. I think she has three more racks just like this now. The number of racks expands as do the number of children she has, plus the number of sports that they play. My red shoes that I wear when in Canada. Our grandchildren thought they were a bit much at first, but they are growing to like them. 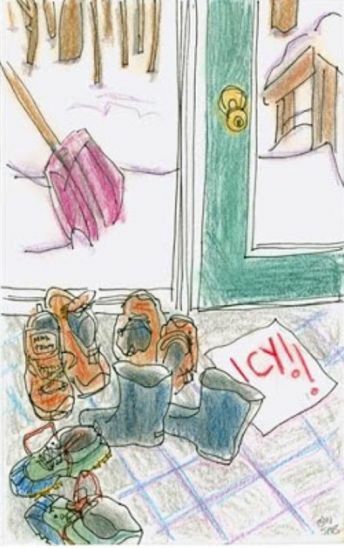 Or at least getting used to Grandma with red feet. 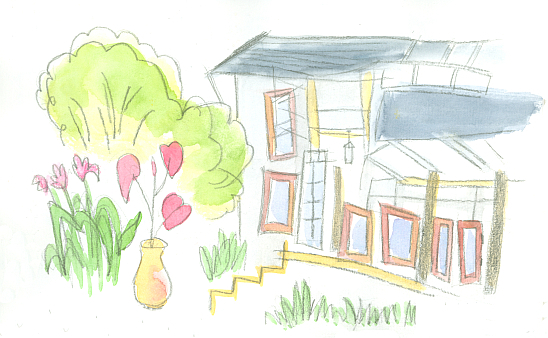 A quick drawing of our small front hall. The door is glass and the window next to it is floor to ceiling glass, so you get a really good view of the snowy hillside just outside. My kind husband left early that morning, and left me a warning note. 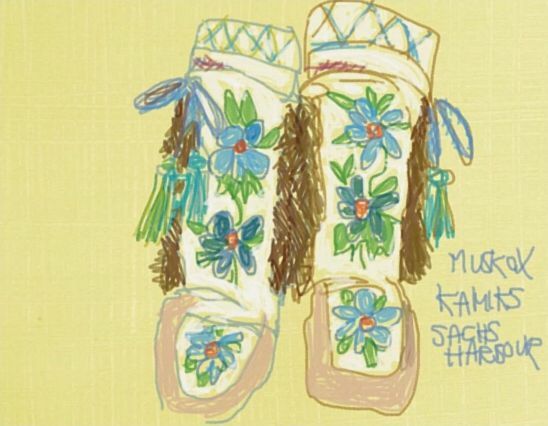 Speaking of wintery footwear, here is a digital drawing of some native leather and beaded boots from Sachs Harbor, Canada. I spotted them at the Edmonton International Airport in a museum display case.And drew them on the spot as we waited for our plane. 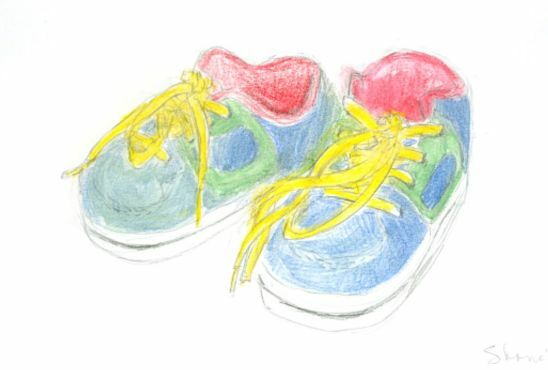 And more shoes, maybe a toddler portrait. Our younger grandson was about two years old when he wore these. I has just finished scraping mud off of them. And again, more toddler shoes. Maybe about three when he wore these. I will end my collection with a totally different look. 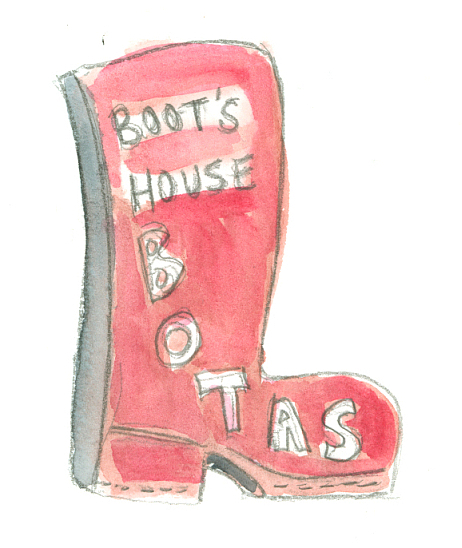 These boots are tall, covered in maple leaves, and not made to be worn. This shoe display was in the window of the Batta Shoe Museum in Toronto, Canada. If you ever get a chance to go there, you must. It was a wonderful experience, although toddler Wyatt had to be removed. I pushed him in his stroller up and down the street. Which is where I saw this display, and drew it while I rocked our grandson back and forth. 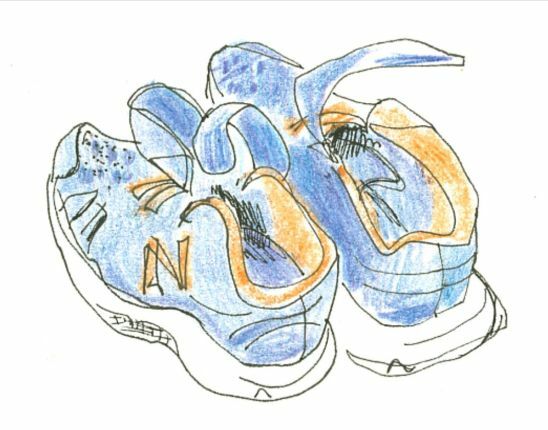 One more thing about shoes to mention. First footing. One branch of my husband’s family came from Scotland, the Glasgow area to be more exact. This was about 1900 I think. In the 1960’s when I joined the family, their New Year’s Eve gathering had remnants of traditions from Scotland. We sang Auld Lang Syne, which is about remembering past times, places, and people. And the family recruited a party participant to do the first footing, or be the “first foot”. There are the hard and fast rules of what to do at midnight to bring good luck in the New Year. The person who first crosses the threshold must be male and have dark hair. (I read online that this was to insure that the person was not a Viking, known to have blond hair). I think the other customs had been forgotten here in the New World. That is, I do not remember the first footer bringing in gifts such as a silver coin, shortbread, a black bun, some salt, a lump of coal, or a dram of whiskey. Although there was plenty of shortbread and whiskey in the room. But certainly the tradition persists of wishing everyone a Happy New Year. And so I do. 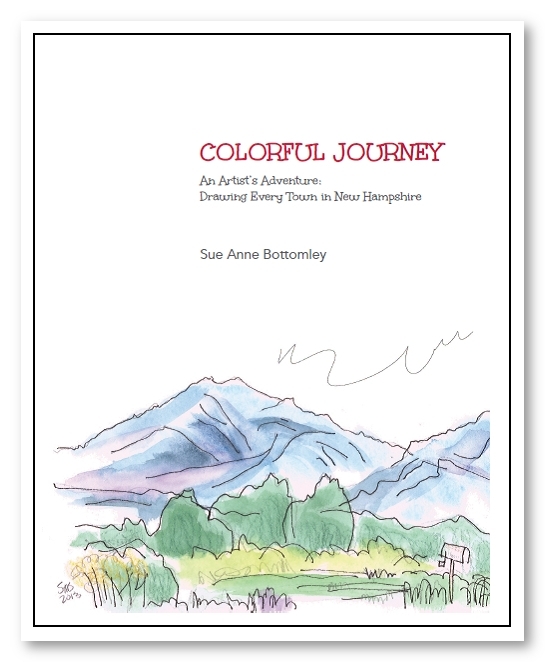 I’m happy to announce that I will be participating in the Authors Night gathering at Zorvino Vineyards in Sandown, New Hampshire, on Friday January 18 from 6 to 9 PM. 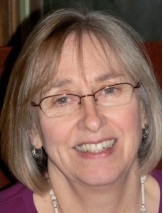 Come take a look at my three books, chat about future book possibilities, page through other books by local authors, and perhaps partake in the offerings from the site sponsor. 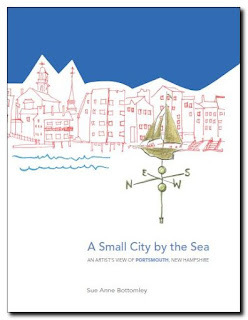 A drawing and description of every one of the 234 towns and cities in New Hampshire. 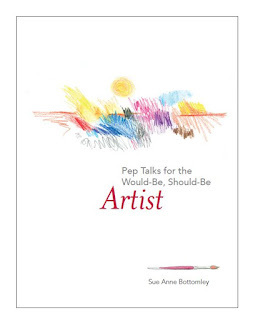 A motivational book for those just starting out in art, or for those who were once there and are having a hard time getting back. 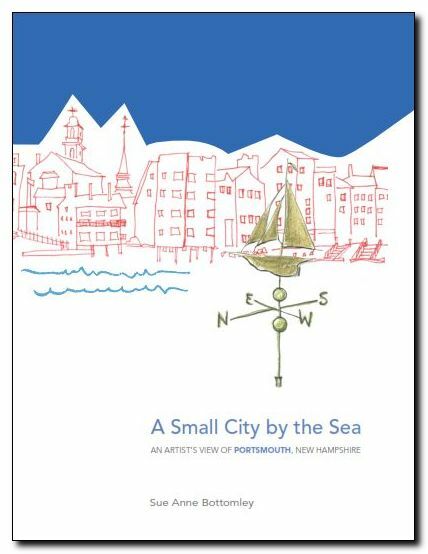 The product of wandering around Portsmouth through the year of 2017, sketchbook in hand. Bring it with you on your next visit there, and follow along.